Generic Company Place Holder Picfree - Send Picture Messages (MMS) Free! 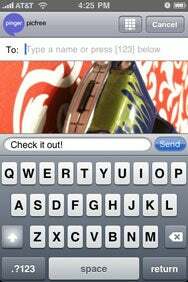 Pinger, which makes the popular Textfree Unlimited app, also has an App Store offering that lets you send picture messages with your iPhone or iPod touch. Apple, of course, added Multimedia Messaging Service (MMS) support to the iPhone OS last year, with AT&T support the capability last fall. But sending text messages with images isn’t free—or available at all, if you’ve got an iPod touch or original iPhone. A Picture’s Worth a Thousand Words: Select an image, add a message, and send it off to a friend with Picfree—only without the cost of sending an MMS message. That’s where Picfree comes in. The $6 app lets you send as many MMS messages as you like from any iPhone or iPod touch for free. Using the app couldn’t be simpler. The first time you launch Picfree, you’ll have to enter your name and e-mail so your recipients know who’s messaging them. Then you just choose a picture from your photo library or take a new one to send (if you’ve got an iPhone with a built-in camera, that is). Picfree uses your mobile address book, so when you start typing in a person’s name, the app starts suggesting contacts to send the message to. You can also just type in a phone number or e-mail address. If you are sending the message to a phone that can’t receive MMS, Picfree gives you the option of sending the message as a text with a link to the image. You can also type in a short message to go with the picture and tap send. Just like that, you’re sticking it to The Man and sending picture texts for free. Whatever picture and message you send via Picfree get uploaded (and stored for 72 hours) on Pinger’s server; from there, it’s sent out to the recipient as an MMS. The person on the receiving end will incur regular text charges from their carrier. Any reply they send back to you goes to the e-mail address you provided the first time you used the app. To that end, Picfree is a one-way street—it cannot receive text messages. This leads to a non-threaded conversation, the app spares you the extra cost of sending MMS messages. Picfree is very easy to use and can really save you some money on texting fees. The $6 app should pay for itself quickly if you like to send lots of picture texts. The non-threaded nature of the conversations is a slight drawback, but certainly worth it to get free MMS on your iPhone or iPod touch.